How can Acumatica help you delight your customers anywhere, anytime? Find out in less than 3 minutes. 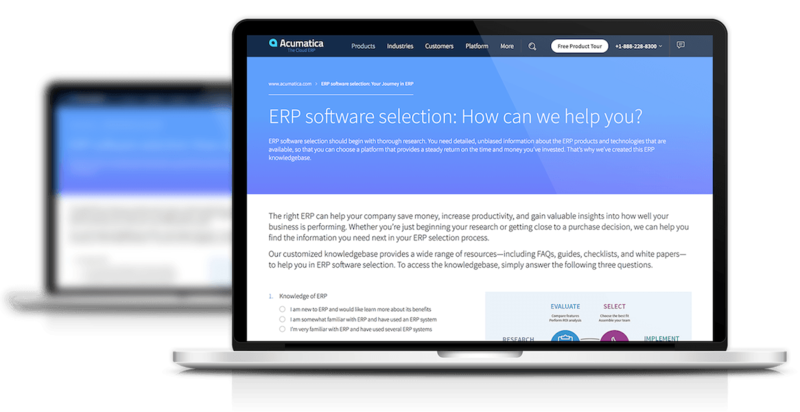 Acumatica again delivers significant usability and product features in our latest release. 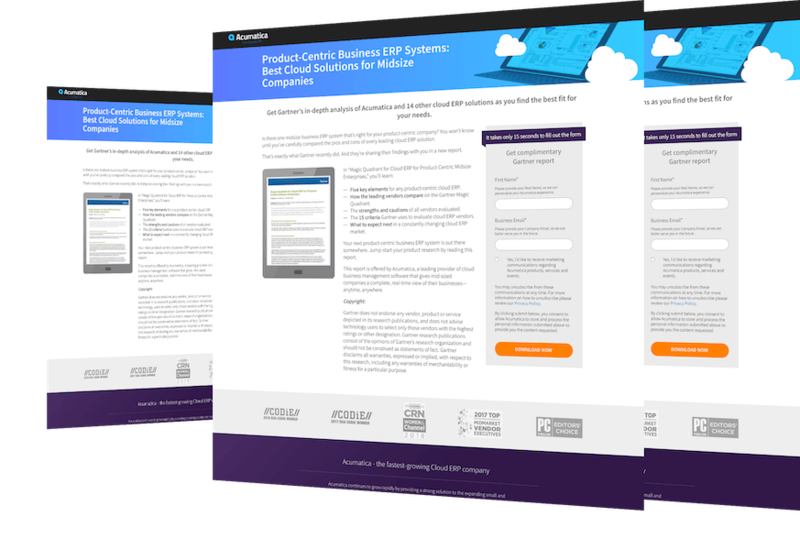 Compare your leading choices side by side in this report from IDC. You’ll shave hours off your product research. After 10 years and 4,000 customers, Acumatica isn’t a newcomer anymore. Find out why one analyst believes the company’s best is yet to come. Gartner recently compared 15 leading solutions for midsize enterprises. Get their in-depth analysis in this free report. 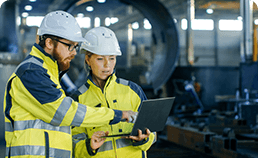 The process is much easier when you have IDC’s expert advice. 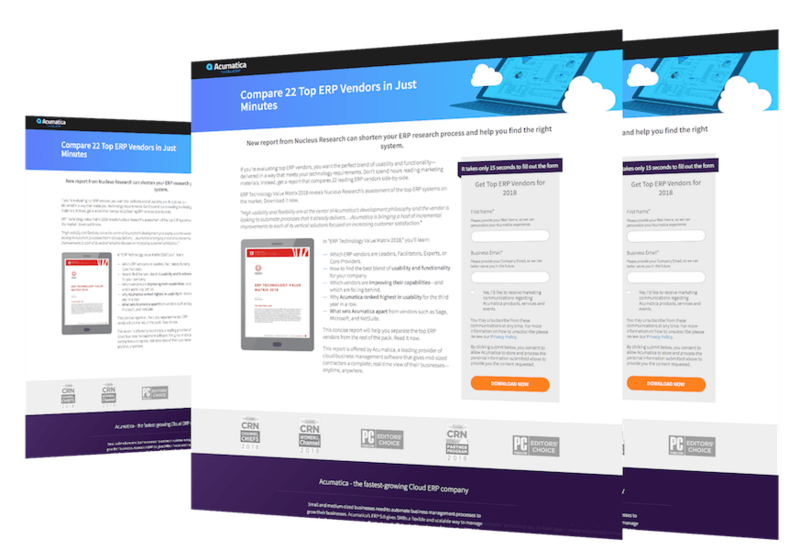 Get their reviews of 11 vendors in this free report. 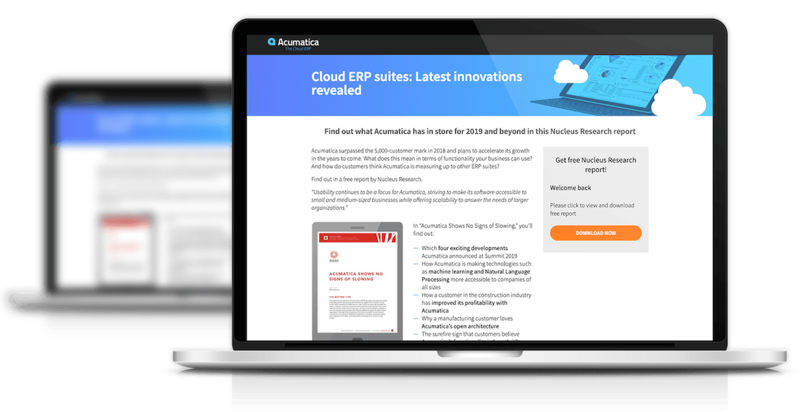 Read this Nucleus Research report to find out what innovations Acumatica will release in 2019 and how they can enhance your business operations. 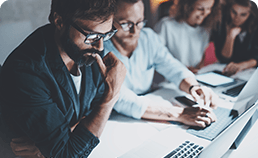 How do 11 leading vendors measure up? 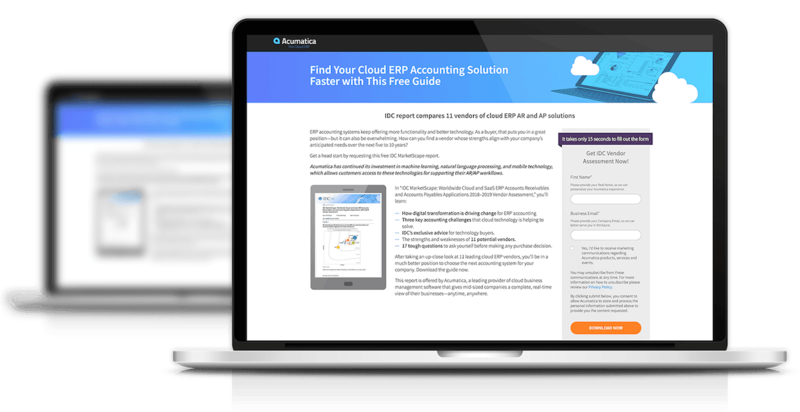 Find out what IDC is saying about Acumatica Cloud ERP and its competition. 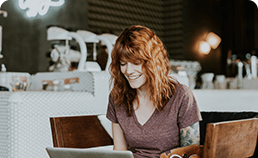 We’ve assembled a vast knowledgebase of the best decision support resources we could find—and we’re making it available to you! Here’s what to expect in 2019 as Acumatica incorporates breakthrough technologies into its software. 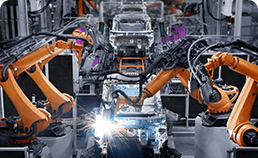 Want intelligent, scalable technology? Thoughtful user experiences? And unrivaled support? 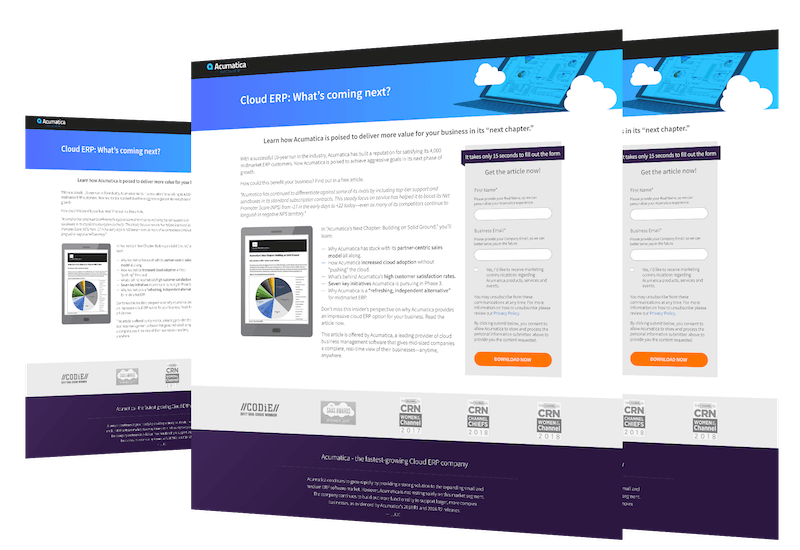 You’ve found the right cloud ERP. 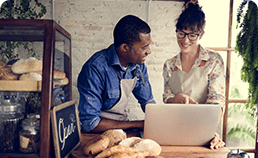 You need the right technology to connect your business and delight your customers. Delivering it is our top priority. 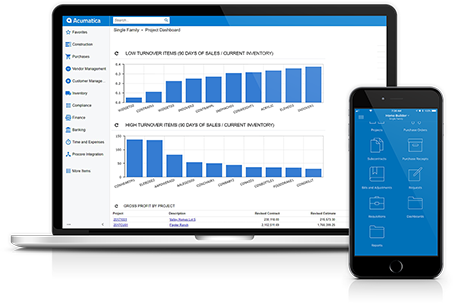 With Acumatica, all your data is connected and at your fingertips. And there are no irrelevant features or inflexible processes to bog you down. 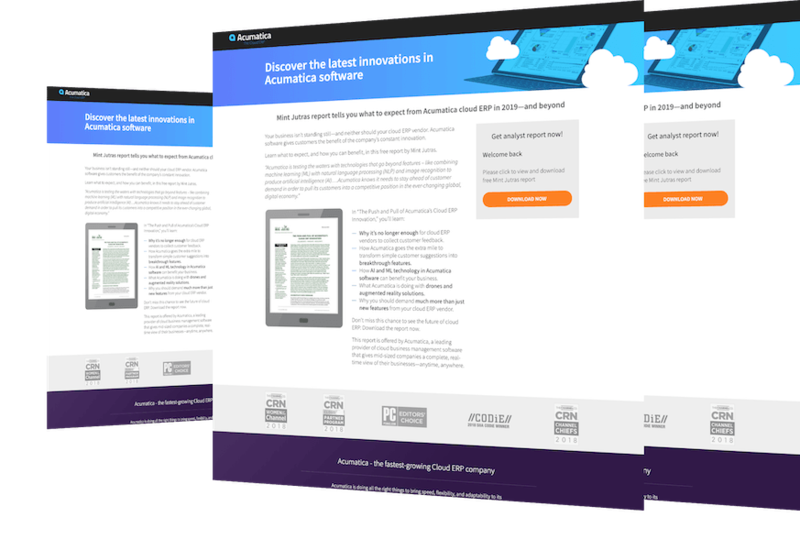 Acumatica was built for the cloud and designed for the way you run your business. All your processes share the same data. Your information is available anytime, anywhere. Everything leads to your customer. With Acumatica’s flexible licensing plans, you don’t pay by the user—you only pay for the computing power you use. This means your technology can scale with your business instead of being a drag on growth. Our pricing is stable and predictable, and we’ll never “buy your business” with an artificially low introductory rate. No matter which software you’re using, issues and challenges will come up. When they do, we’ll always take your call, treat your pain as our pain, and stay with you until it’s fixed. We have the industry’s highest customer satisfaction rating because we don’t just care about your success—we care about your customer’s success too. 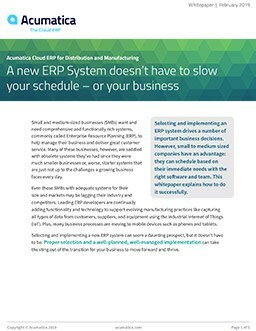 "I did demos with a lot of the ERP companies, the big ones Infor and SAP. What I found with Acumatica and the partner ASI was their willingness to answer all my questions and do multiple demos. From the start I really felt like they were here to fully support us."